A few years ago in the US, various groups calling themselves socialist, have seen some electoral successes. Unlike Bernie Sanders, these groups are composed of people who at least can call themselves “socialist”, since they are in “socialist” political organizations. Socialist Action, Socialist Alternative have had members elected to city councils. The Democratic Party political machines that run most of the cities have to allow something on the left to occupy the space that they can no longer politically fill. These left parties act as auxiliaries, reinforcements to a political machine that is highly skilled at crushing and co-opting all signs of political opposition. As long as the political machinery of the state is intact, participation in it is primarily a form of collaboration with the class enemy, wittingly or unwittingly. In the background of these elections is the occupy movement. Electoral politics “activism” drained the life out of these movements with no perspective beyond a protest movement and some basic reforms, or at least housing and a higher local minimum wage if nothing else. This is all fine, but there is more that must be considered when participating in the governance of an imperialist power like the US. The US state is drenched in blood. It is a killing machine that has no “off switch” and will keep killing until it breaks down. It is the very regime that now plays a main part in starting what will eventually become a third imperialist world slaughter. It is a regime that has committed years, decades, even centuries of mass murder and torture all the while spouting rhetoric of democracy. Is it even appropriate to be pushing for representation and reforms from such a regime? The Democrats and Republicans will still be calling the shots in these city council boardrooms. These elections have come after years of people not even bothering to run candidates for minor left parties. They are an indication that workers are willing to break with what they know, but not able to make the ideological break far enough to stop voting in capitalist elections. The last socialists to achieve representation in this way on any large scale was the old Socialist Party of America. Even when they politically ran entire cities, when it came to trying to get elected to the congress in Washington or at the state level, they were crushed. Five reps from New York state refused a seat even when elected. Victor Berger sent back to hold another election and get himself re-elected before being allowed to take the seat he was elected to. These socialists had some useful reforms that everyone has benefitted from, like sewer systems, and hence they were called "sewer socialists". All reforms come to nothing, as surely as those same sewers are crumbling away today due to a chronic lack of capital and maintenance. The Washington regime has always allowed a certain amount of dissent, but within safe and proscribed bounds. It is also a regime that knows when to crush its enemies when they start to become a problem. 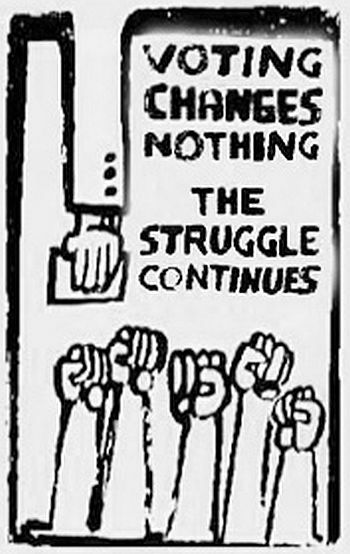 The IWW arose in large part due to the brutality of the bourgeoisie and the hopelessness of the parliamentarism that was the practice of the old social democracy. If there was ever a place in the world that was a textbook argument against electoral politics, that it is somehow a tool for workers to use in pursuit of their emancipation, that place would be the US. Dems and Reps receive automatic ballot access while every other organization has to go get two or three times the number of signatures required because electoral officials, appointed by the Dems and Reps, at least half of them and issue a legal challenge against any third party candidate that manages to even get that far. Where third parties are allowed representation are primarily in posts in constituencies that are too minor for the ruling parties to bother with. Ralph Nader and his “Green Party” campaign had to go to court almost 40 times in every single state just to get on the ballot. Even then he wasn't even allowed in the audience to the debates. Even when elected, the third party socialist will have to fight in court just to get their party affiliation attached to their name as it is with the elected officials with the ruling parties. As the SAP council member in Seattle had to do. This isn't a defense of supporting Third Party reformists, nor does this give a picture of a political order than can be changed through reformist means. It is an illustration of a political order so rotten as to require its overthrow, participation in it is collaboration with a class enemy. Where the early Bolsheviks could use the rotten Czarist parliament as a platform for propaganda, where early German Socialists could use it to denounce the war, today a political organization would not even have access to the media needed to accomplish such a task. Our new social democrats, come out of the shards of the shards of the old Socialist Workers Party. A Trotskyist party which after years of transitional thesis social reformism ended up by becoming Castroite. Even this Socialist Workers Party was a victim of political repression and rampant spying. More than a few of the groups that came out of this party were the result of that political sabotage, when they weren't sabotaging themselves. It is the aim of these political forces, auxiliaries of the Democratic Party machine, to give social-democracy a militant appearance at a time when many younger workers in the US are starting to identify themselves as “socialist”. This phenomenon is not unusual given the austerity, lack of job prospects, housing, decent pay that has continued to deepen over the last decades. These first attempts to turn away from the current order have been met with greater repression and blood-thirsty insanity on the part of the bourgeoisie. A revolutionary has to be a part of their class, with their class, but that does not mean misleading or lying to them about the prospects of reform if only more people just voted for a third party. In Wisconsin "Recall Walker" was the slogan used to tell workers to stop protesting and go vote, it was used to drown out calls for a mass strike. These minor election victories for socialists aren't a beginning but an end, a punctuation mark at the end of the occupy movement and the ballot box becoming its coffin. The “no politics” mood of the protests played to the strength of the dominant political ideological force of the bourgeoisie. One argument for participation in elections runs that since elections are the only time workers are trained to think politically that makes it a primary time to go out and speak to workers—something that can and should be done without participating in a bourgeois election. Why are you going to vote this year? Have you ever gained anything for yourself by voting? Don’t you know that the whole business of the elections is a fake intended to make you believe that YOU have something to do with running the affairs of the country? Think about the matter for a moment! What did you have to say about the question of who should be the Presidential or other candidates? Did you choose any of them? You know you did not. You know that all the old party candidates who are running for office were put up by the political machines over which the capitalists of this country have absolute control. This was from the early CP, in the phase usually written off as 'ultra-left' by later leftists who are embarrassed at the very idea that their mother party would've said such things. Things haven't changed as far as the political set-up of bourgeois governance is concerned, if anything it is more true now than it was then. Hope springs eternal in the breast of reformism and its hopes are dashed with equal regularity. The capitalist system needs to be smashed. Where reformists wish to fix the capitalist machine, revolutionaries must seek its destruction. Participation in the electoral process legitimizes the republic of capital strengthening the very state institutions that exploit and kill us. UCP statement. Boycott the Election! 1920. Copy in NARA collection M-1085, reel 914, file 180337-33-1. Marxist Internet Archive. Anna Louise Strong was social democrat and pacifist during WWI, later a stalinist. She helped found the Moscow News, and was a supporter of the PRC. It was in her role working in the local Seattle labor press during the Seattle General Strike that she was at her best and is probably what she is most known for. A good clear statement from 1920. The capitalists control the newspapers. They control the politicians. They control the schools, colleges, and churches. They control the meeting places. They let you vote because they know that through their control of the means of information they can make you vote for what they want, and that no matter which way you vote, their right to rob you will be protected.